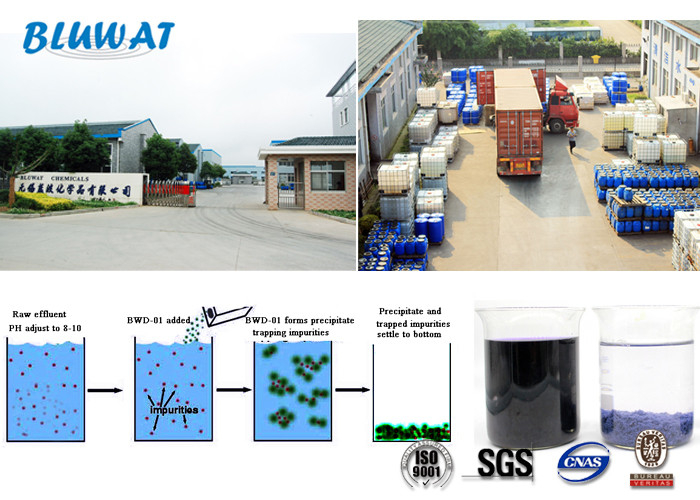 BWD-01 color removal chemical is a quaternary ammonium cationic polymer, a special product for treating textile wastewater color problem. It is a new type of high efficient decolorizing flocculant, for de-coloring, flocculating, CODcr decreasing and other applications used to remove the color of wastewater generated by textiles process houses and dyes industries and other fields. 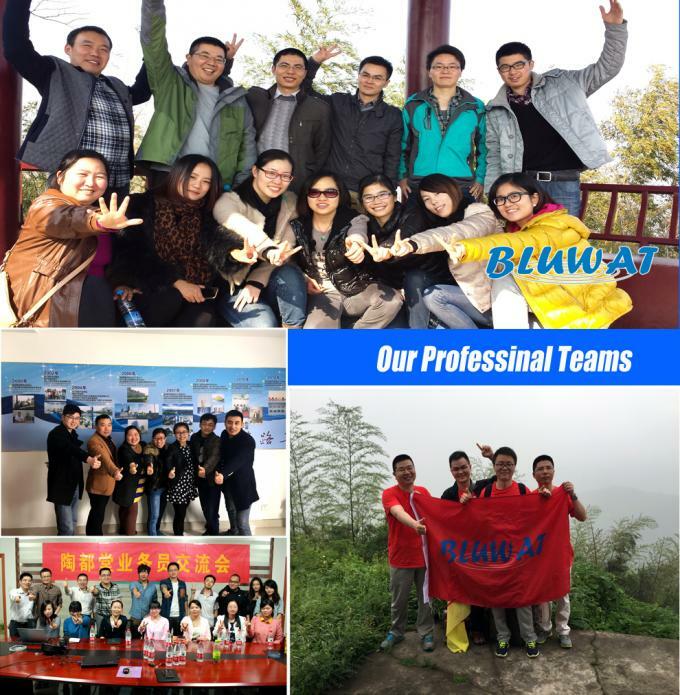 Due to a large number of cations, the negative charge is brought on dye molecules are neutralized instability, at the same time with BWD-01 color removal chemical by a large number of hydrolysis of flocs. Can be adsorbed dye, destabilization of the snare, from water separation, so as to achieve the purpose of bleaching. It is medium molecular weight copolymer. It is mainly used for waste water treatment for textile, printing, dyeing, paper-making, mining, ink, and so on. It can be used for color removal treatment for high-colority waste water from dyestuffs plants. It is suitable to treat waste water with activated, acidic and disperse dyestuffs. Good performance of COD decreasing and strong decolorization. 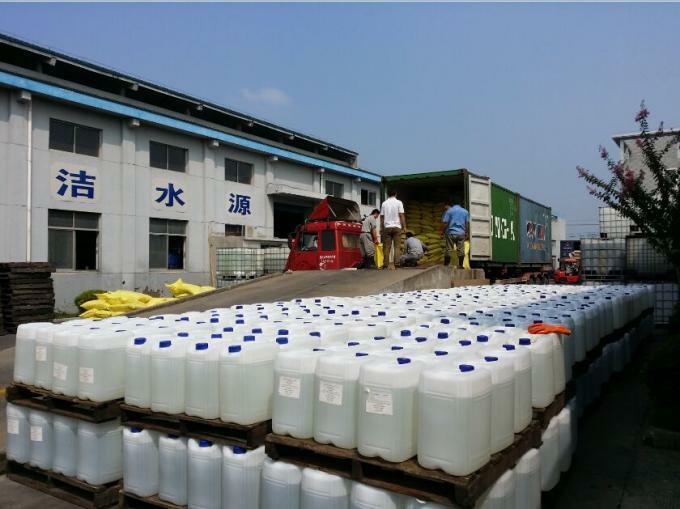 Used to de-color high-colority effluent from different industries. Especially high performance to treat wastewater with Reactive, Acid, Disperse, Direct Dyestuff etc. No effect to biological and MBR systems. Have a solution of Anionic Polyelectrolyte, 0.1%. Adjust dosage of BWD-01 and PAC to do more test to have a better testing result. Harmless, non-flammable and non-explosive, can not be placed in the sun. Packed in plastic drums with each containing 30kg, 50kg, 250kg , 1000kg, 1250kg IBC tank.